Security Central attended the annual Honeywell Authorized Dealer Conference in November. This is an annual gathering of all the Honeywell Authorized Security and Fire Dealers in North America. On the final night of each conference, Honeywell recognizes certain dealers for exceptional performances that year. In addition to being recognized as a Platinum-Level Dealer, Security Central received two specific awards that evening. The first recognized companies which are especially committed to community service. Thanks to the efforts of our team, Security Central was recognized as one of the top Community Service-oriented companies. Security Central also received the Commercial Installation of the Year Award. Earlier in the summer our team had upgraded a client’s outdated video surveillance system and added our AlarmView video verification service. When someone broke into their lot the upgraded system alerted our dispatchers, provided video verification of the intruder, and led to the successful arrest of the perpetrator. 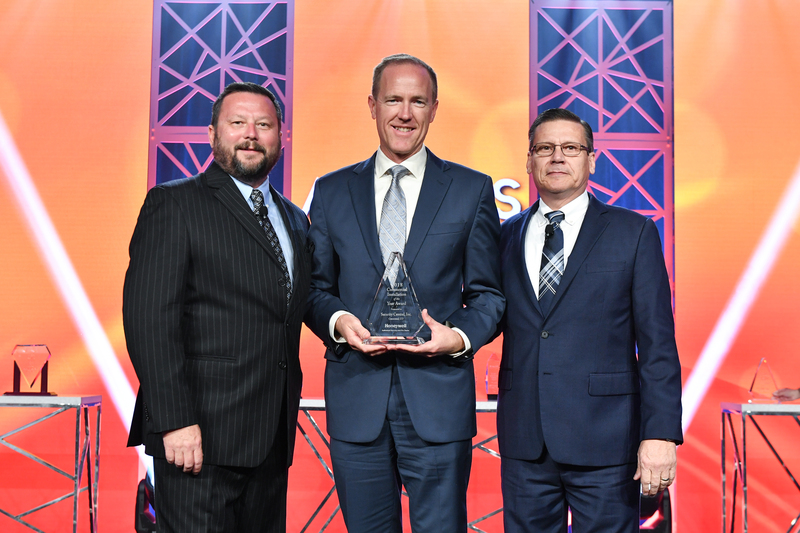 Honeywell recognized this particular job as a representation of what our industry is all about… helping to stop the loss of property and lives! Click here to see a video of these events. The picture above is our president, Jordan Jackson (center), receiving the award on behalf of the Security Central team.